It’s spring here in San Diego. The sky is blue, the temperatures are nudging eighty degrees, and I am working hard to come up with all the ways we can eat our loquats before they shrivel into black hairy clumps. I realize that there may be those reading these words who are dealing with highs of forty degrees, mud, losing the bulbs they just planted to woodchucks. There are those too who haven’t seen the sun or blue skies for more than a minute since last fall. And there are those who will have absolutely no idea what a loquat is or why anyone would want to eat one. I occupied all of those groups at one point. These days, I not only know what a loquat is but I love the fruit from our particular loquat tree. How could I not? It came to us nearly twelve years ago, a bare stick poking out of a little black pot half-full of dirt. It was a time of beginnings for us. I was a transplant and my husband was rediscovering all the things he’d loved and missed about California. He still speaks of his time in New Jersey (where we met) as “doing time.” That first spring, he was striding around a local home and garden show with a smile of a man who knows he will never feel snow sliding down his neck again. We almost passed the tree on our way to our car after seeing all we’d come to see. The folks of the local chapter of the California Rare Fruit Growers Association were packing their truck to head home. We bought a fig tree (another stick in a pot) and then my husband told them he loved loquats. Apparently not many people tell them that. They threw in the loquat for free. “What’s a loquat?” I asked my husband as we carried our foundlings home. That was all he needed to tell me. The loquat was like the wild rapini he and his grandfather would pick every Sunday back in the California of the forties and fifties, or the prickly pears that reminded his grandfather of Italy. 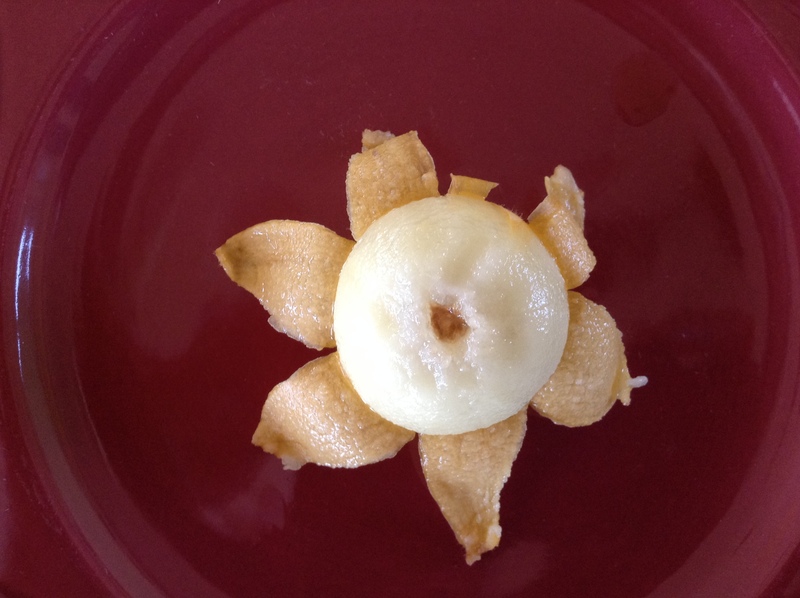 The loquat was wrapped up in all the memories of being with a grandfather he loved and knew, for a time, better than his father who was away at war when my husband was born. We waited nine years to pick a loquat off our tree and now they arrive every February or so. When someone asks me to describe a loquat, I struggle. 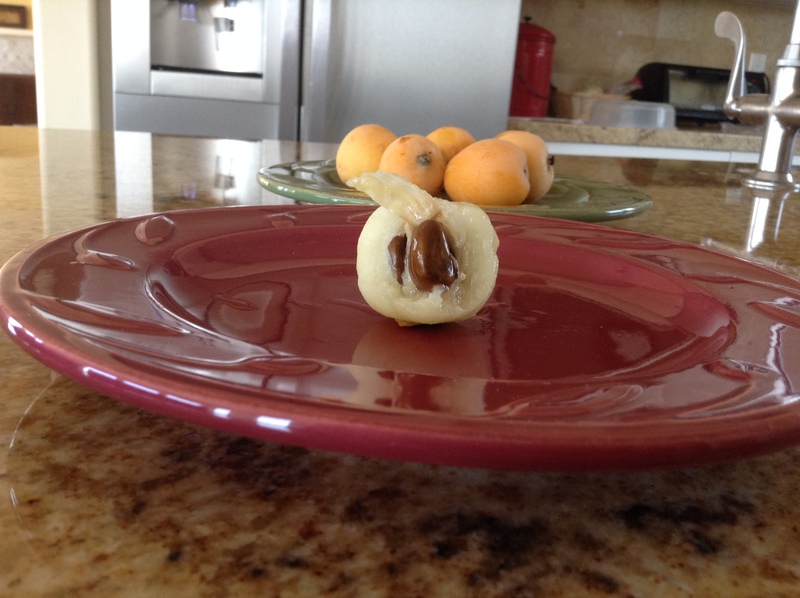 It looks like it started out to be an apricot and then changed its mind. It’s a little fuzzy like a peach. There is a sweet, spicy, sometimes a tiny-bit lemony taste when it’s at its peak. Loquats start to shrink within an hour or two of being picked which is one reason they aren’t grown for commercial use here. Another reason is that four or five pits form the core of each one, competing with the fleshy, juicy fruit for space inside the skin. The upside of this is that you can eat a lot of loquats before you’ve filled up. There is no dignified way to eat them. Juice runs down your chin, between your fingers. The pits, smooth and glossy as stones in a brook, fill your cheeks. You must spit them out and there is no polite way to do this. If you are outside, of course, this is no big deal. My neighbor, for example, loves to practice her aim. Her husband, who is usually her target, does not appreciate this. 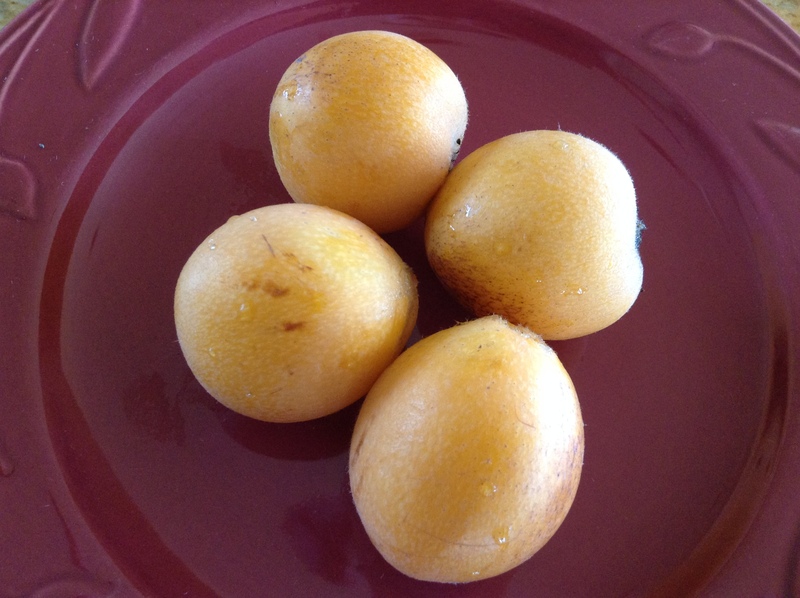 If you are inside, though, here is a look at how to enjoy a loquat fresh off the tree, along with some wonderful links to resources, recipes, and all kinds of factoids that will allow you to vicariously enjoy the loquat. I encourage you to check them out although the closest I will probably come to doing anything with a loquat other than eating it fresh off the tree is freezing it, skins and all. You can take them out one at a time. It’s like eating a bit of spring all year long. Step 2: Peel back the skin so the globe of fruit is revealed. 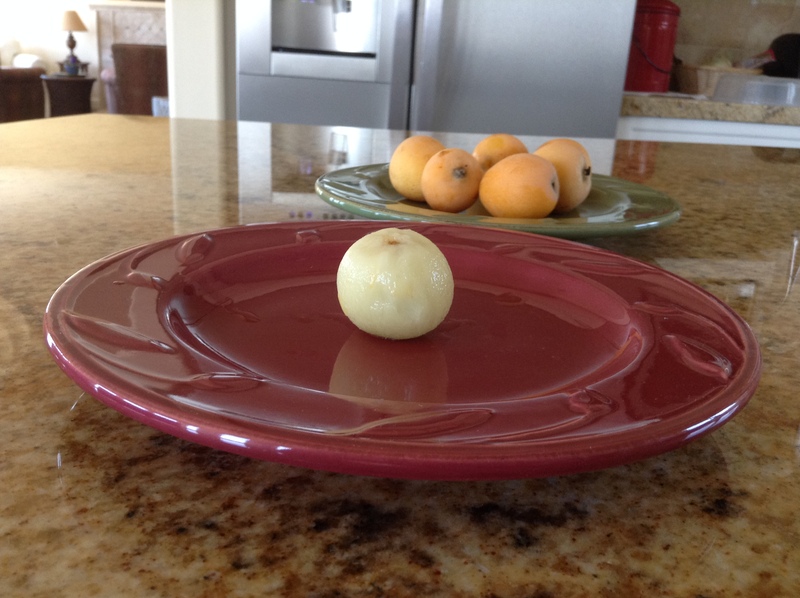 Step 3: Toss skin and admire the perfection of the naked loquat. Step 4: Take a bite from one side and then work around in a circle until all the fruit is in your mouth and the pits are tumbling from your checks like quarters from a one-armed bandit. 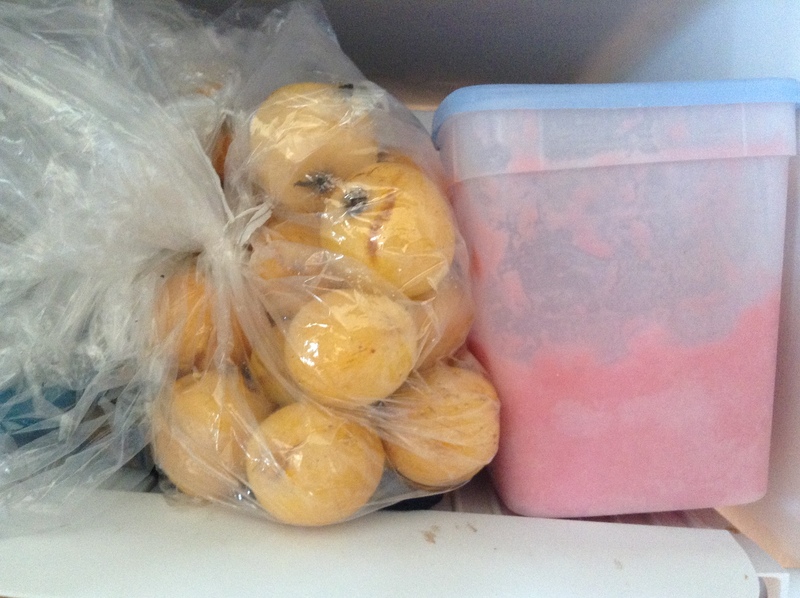 If you’d like to try it out on a frozen loquat, go ahead. When you are ready to enjoy them, take a couple out of the bag you’ve stashed in the freezer. Let sit for five minutes or less. Peel as instructed above and enjoy. The great thing about the frozen loquat is that the flavor bursts through in an icy explosion that immediately makes you want more. For the uninitiated, loquats have nothing to do with kumquats which is a citrus. There is actually a site called Loquat World! And in addition to all things loquat, it provides some interesting recipes. Pour all of the vodka or rum in a gallon jar and then fill it up with peeled loquats. I cut out the bloom end to expose the seeds. Let the mixture sit for 2 to 3 months and then strain off the loquats. Mix equal parts of the Liquor with simple syrup, e.g. 1 cup alcohol and 1 cup simple syrup. They look a bit like yellow plums. I hadn’t heard of one til now but it sounds delicious! Loved this Betsy. I grew up eating these as a result of their family passed down history. I love them. This past winter (or lack there of) when colds and flu were in full swing my Mom was craving them and I went to a dozen different ethnic and specialty produce markets just trying to at least find the canned ones. The little stick tree is so pretty now and a beautiful reflection of your years together here in Cali! We’ll make sure you get some! Now that we know about freezing them, we can maybe figure out how to share them more easily. I’ve never seen one of those before. It kind of reminds me of a Mangosteen for some reason, even though it doesn’t really look much like one. Just out of curiosity – Which more commonly seen fruit would you say they taste the most like? The closest I can come to it is a plum without the skin but infused with a gentle tartness. Does that help? Of course, each one tastes just a little bit different. And Greg, the loquat is believed to have originated in China so perhaps you can find your way to a tree there? Okay, I have a rough idea. Just showed my gf a picture of one and she knew immediately what it was, so I guess I could get one out here if I wanted. I love the thought of purchasing a tree and watching it grow with your marriage. My first thought was to exclaim, “Nine years! That’s forever!” …but then I remembered that for the biggest things in life like partners and children, nine years is the blink of an eye. You are so right, Jennie. Nine years flew. And the vigor and resilience of our tree (it went through house construction, long droughts in its pot, and more) is a source of inspiration and delight. We could try to figure out how to ship a few but they will probably lose a lot in transition. That’s their magic — must be savored in the present moment, like many things in life, right? I grew up with loquats from various places as a child, I remember a tree being in the gardens where my sister married and all the bridal party running about spitting seeds, very dignified. It makes for unique memories. 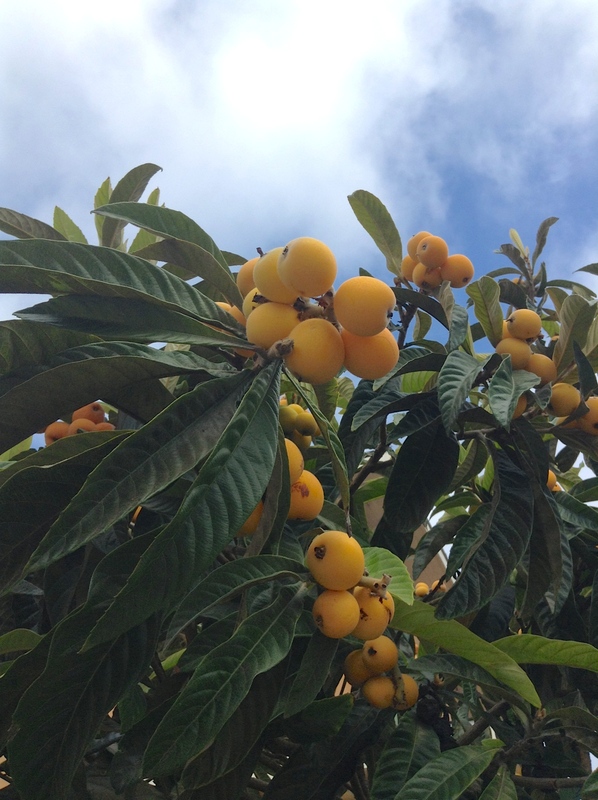 Loquat trees are rare about the place these days and I miss them, it is always a treat to find one in fruit, I have been known to revert to childhood and nick the odd fruit over a fence if I see one, much to my husband’s chagrin. Thanks for taking me back. How nice to read this. I’m glad you shared your loquat memories. If you are ever passing our tree, help yourself!